Malin 1 is the biggest spiral galaxy known. Is This the Biggest Spiral Galaxy in the Universe? Malin 1, one of—if not the—biggest spiral galaxies in the Universe. 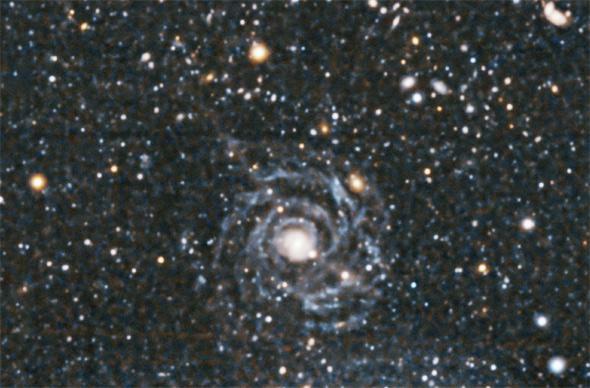 From the cream floating in your coffee cup to hurricanes to galaxies themselves, spirals form on a vast range of scales. They may be for different reasons (coffee and hurricanes have faster rotation in the center, winding up the arms, whereas galaxies form spirals from a more subtle and complex effect that acts like an interstellar traffic jam), but when you have stuff that spins, spirals can arise naturally. But how big a spiral can you get? Our Milky Way galaxy is pretty beefy, one of the bigger spiral galaxies in the Universe. It’s roughly 100,000 light-years across, or a quintillion kilometers. That’s a lot of kilometers. Don’t go bragging to your friends just yet though. It turns out spirals can get bigger. Way, way bigger. The galaxy pictured at the top of this post is called Malin 1. It’s faint; so dim it was only discovered in 1986, and was the first discovered in a class of galaxies called low-surface brightness spiral galaxies. Most spirals are pretty bright and easy to see, but LSBs are much fainter. Despite that, they can grow to huge sizes. I’ve known about Malin 1 for a while, but it hadn’t really registered with me one way or another. That changed instantly when I saw a new paper about it, which was featured on the American Astronomical Society’s Nova site, where notable discoveries are highlighted. I saw the photo of it and nodded in admiration; it’s a very pretty and interesting spiral. But then I saw the distance, and my brain did a double take. Malin 1 is 1.2 billion light-years away. But it is: 1.2 billion light-years is a tremendous distance. If it’s that far, and that big in the image, it must be huge. Freaking huge. Yeah. My brain was right. Malin 1 is more than a half-million light-years across. Holy Haleakala. That’s ridiculous. It’s hard to explain how big that is. The Milky Way is titanic, and Malin 1 dwarfs it. Here, this’ll help. I added a drawing of the Milky Way into the Malin 1 image, roughly to scale. Malin 1 is easily five times wider than the Milky Way. That’s very interesting indeed. How do you get galaxies that big? We know most (if not all) galaxies grow by eating smaller galaxies (literally the smaller galaxy gets ripped apart by the bigger galaxy’s gravity, its gas and stars ingested by the bigger beast), or merging with galaxies of comparable size. We can see the leftover remnants of smaller galaxies the Milky Way has eaten, and in a few billion years we’ll double in mass when the Andromeda galaxy collides with us. But it’s not clear how Malin 1 (or other low surface-brightness galaxies like it but somewhat smaller) grew to such enormous proportions. And why isn’t it brighter, like other, smaller spirals? Digging through some papers on Malin 1 I found that it’s not forming stars as rapidly as the Milky Way; stars are born in the Milky Way at twice or more the rate they are in Malin 1. That may be why it’s dimmer (fewer massive stars born means less light coming from the galaxy). But I don’t think anyone really knows. I’m usually not all that impressed by cosmic records; finding the most distant this or the biggest that. I’m more excited when that record tells us something. The most distant galaxy tells us how young the Universe was when the first galaxies formed, for example. In the case of Malin 1, it’s telling us how physics operates on the biggest scales. Spirals can form in galaxies five times bigger than ours … and somehow that may also be correlated with the galaxy being dim. There are also some peculiar features in Malin 1; you can see a long straight feature pointing away from it at about the 11 o’clock position (another one, on the opposite side of the galaxy center, is likely a background galaxy coincidentally superposed). This feature may be a long stream of gas and stars pulled out from Malin 1 by a close encounter with another galaxy off the edge of the picture. These long features were invisible in previous images but can be seen here thanks to the power of the giant Magellan 6.5 meter telescope, which took the image (and some sophisticated techniques used to enhance the image as well). 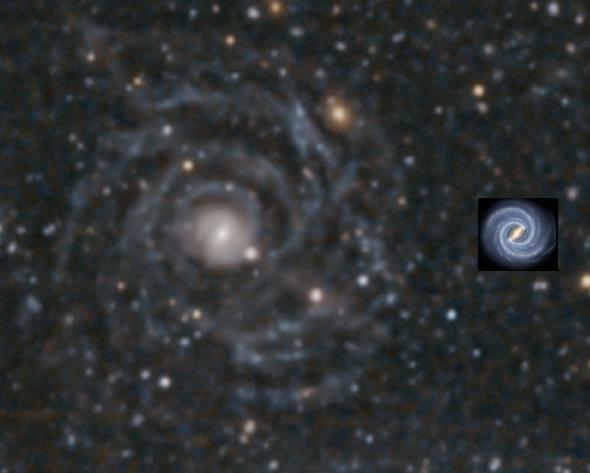 A Hubble image taken a few years earlier only hinted at the far-flung spiral arms, showing you just how important the telescope size can be (Hubble’s mirror is 2.4 meters across). It’s not surprising to me that our census of the Universe is still incomplete; there are lots of things so far away—or close by and so dim—they’re invisible to our prying eyes. But it’s still something of a shock when we find objects this flippin’ huge that have managed to evade us for so long. It’s a sobering lesson. The Universe is almost incomprehensibly vast, and still holds many of its secrets dear. What else have we missed?